9th. August. 1918. Large draft of new officers. Capt. A.C.Welch back. 10th. Col. Wilson is receiving the Cross of the Legion d'Honour, and Macleod the Croix de Guerre, both well merited. Corporal Langridge who had been out with me got the Medaille Militaire plus Croix de Guerre with palmes - the highest French award for gallantry. 11th. Out revolver shooting with C.O. Am beginning to wonder when I'm to get the company promised me. 12th. Lectured the signallers and runners on the lessons I had learned down South. 13th. Brigade Parade to receive the French Awards from our Divisional General. Rather an amusing show. 16th. Left for Tinques - train to Boulogne where I stayed the night. Then out to the Army School at Hardelot at night. 18th. School splendidly situated in midst of sandhills. Glorious sea breezes. This is a school for Company commanders. There are a great many captains and not a few majors attending it. 19th. Grouped into platoons. Lectures. Finished "Soldier Poets". 20th. Played rugby after a busy day. 25th. A swim! A fine busy life, plenty of exercise, odd visits to Boulogne. Good feeding and fine Company. Am feeling fit. Good war news continuing. Monchy has fallen! Hurrah! 30th. Received a nice letter from General H.L.Reid, V.C. Commanding the 15th. Division, congratulating me on my Bar to the Military Cross. 1st. September, 1918. This is a fine war - at Hardelot Plage! Football in morning (Sunday) against No. 2 platoon - a draw. Put up my 'rosette', so had an embarrassing time. Church at night. 2nd. Monday. Played against No. 4 platoon and won by 2 goals to 1. This brings us to the final. 7th. Boxing - and so on - a rare life of sport and fun. 15th. September. Anniversary of my first show, two years ago, at Martinpuich on the Somme. 16th. Boxing. Was beaten by Pullen, an R.E. 19th. Fine dinner at PreChatelaine with Neame, our O.C. Platoon, a major in the Artist's Rifles. Friday 20th. Guest night at the School - terrific scenes - the band - the champagne - the speeches - Burnet - Neame's promotion - rushing the band - dancing on the tables - chairing the Commandant - the names of those who weren't drunk easily counted. Learned that my name had been singled out several days before from amongst the 150 officers at the school for retention as an instructor. It was submitted to Army H.Q. but Army would not allow it as the 15th. Div. is no longer in First Army. Am quite glad. Also heard that I was being very strongly recommended for Staff duties. Seems to me there is no chance of this happening as there are so many senior captains in my own battalion now that I can't even get a company for myself. It has struck me that our instructing officers at the School here are, with a few exceptions unable to inspire any confidence in one. So few of them have ever seen any actual fighting. Some have never been in the trenches for more than a week. Sunday 22nd. Early train. Up to St. Pol with Bob Semple and Brown, two pals at my school. Reached Calonne-Ricquart at 8 p.m. and billeted with Green of our regiment. Monday 23rd. Rejoined Battalion details at Noeux-les-Mines. All well. Found Bennett, our old Q.M. and Major Kirsop. Battalion is now in the line at Hulluch and Loos, near where it was in September 1915. Sgt. Mitchell, my dour, old, trusted signaller sergeant, has been killed in a raid on 19th., after 3 1/2 years very active, courageous service. Poor beggar! A few officers wounded after a successful raid by the Bn. Coogan and McAinsh did well. Prosser gone away for instructional duties. I wonder what they will do with me! I heard from Bennett, the late Q.M. of the 11th. Bn. that after I had come out of the first show at Ypres last year (where I was with the stretcher parties) that a deputation from amongst the men, headed by Sergeant McQuarrie of 'D' Coy. waited on the C.O. at Orderly Room (i.e. Colonel Duncan) and said they had come to ask if I might be recommended for gallantry while with them, as they thought I deserved it thoroughly. Duncan, of course, said this was too irregular for anything. This now brings back to my memory many complementary and sympathetic remarks by officers which I did not quite understand at the time. Well! It was better to be thought well of by the men than to receive any decoration at the hands of Colonel Duncan. 24th. Took a cycle run up to the Battalion in the morning - H.Q. in the village of Loos. Stayed for the tour. Had a walk round companies. Very interesting place. Am to be signalling officer in the meantime. Played Vingt et un at night. Don't see any chance of promotion yet. Am full of beans and itching for work. I'd almost like a battle (Note from RLM, 1972: pseudo-euphoria?). 25th. and 26th. Round line a lot. Now know it backwards. Great rumours that Boche is going back. We are going to try to hurry him. Saw figures for our casualties at Soissons - pretty high, but not half as bad as at Ypres. For the Division, figures are 165 officers and 3351 other ranks, of which 34 officers and 441 men were killed. 27th. Conference. All excitement. Hope the Boche will move. 28th. and 29th. More conferences and preparations. Camerons did a raid on our left but took no prisoners. 30th. Am taking over from Captain Macleod as he is going on leave. 1st. October, 1918. Fairly quiet day. Began again as acting Adjutant. Boche patrols pretty active at night. Got no sleep owing to continued calls. About 9.20 a.m. word came that Boche was going back in front of Hulluch. Our companies, headed by patrols, were moving forward an hour later. We encountered resistance from Bois de Dix-Huit and Bois de Quatorze but made very good progress by manoevring. Our first and second objectives taken by 2 p.m. 'B' and 'C' Coys. in front, 'D' and 'A' in support. Mens' spirits rampant. Lord! How I have longed for this time. Kept splendidly busy. C.O. at advanced H.Q. Very few casualties. At 6 p.m. I went along to fix up food, and then opened a new H.Q. in the old front line at 7 p.m. Busy night again. Messages coming and going. Water, food and ammunition parties. Very dark. No moon. No sleep. Our patrols worked into 3rd. objective during the night, chiefly owing to Nairn, who was topping. It was apparent in many ways that the Hun meant to hold his third line but our early move where we broke in and rolled up his flanks, upset him. Nairn's work was 'A.l.'. We got 12 prisoners, 7 machine guns, and killed 27 Boches. By 8 a.m. on 2nd. Oct. the 3rd. objective was ours all over, and patrols were working into Vendin. 'A' and 'D' went through 'B' and 'C' at 11 a.m. Lord, it was grand! Much sniping. Capt. Billy Irvine on the right simply in his element. People further to the right somewhat slow - opposition from a switch line held them up slightly. Bn. H.Q. 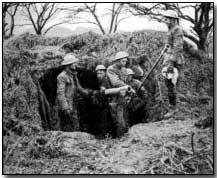 to Bois de Quatorze at 11 a.m. Relieved at night by Royal Scots. Our total casualties 5 killed and about 20 wounded. Back to Loos on 3rd/4th. Grand feed on arrival at old dressing station. Bed at 1 a.m. on 4th. Slept like a log for 8 hours. Bumph all day. 6th. Boche asked for armistice. Hurrah! Hope we don't give it until we reach the Rhine. 7th. to 9th. Having a good time. 10th. Bn. relieved in Loos by K.O.S.B. Came down to Mazingarbe in daylight to a fair billet. 11th. Discussed staff appointment with C.O. and Bde. Major. Will probably remain with the Bn. especially as war is near an end. 13th. Colonel Wilson's birthday! - a big splash. (Note from RLM, 1972: He never disclosed his age to anyone. I guess he might be 2 or 3 years older than myself.). Bed very late. 14th. Busy day. Dined with 'D' Coy. Billy Irvine is going home for six months rest. 15th. Warned to go up the line. Inspection by General Birdwood, G.O.C. 5th. Army. Was introduced to him afterwards. Moved off at 6 p.m. in hell of a hurry, via Vermelles, Hulluch, to Bienfontaine. Arrived at 9 p.m. Cold night. 44th. and 46th. Brigades are moving forward. 16th. Oct. A day of tremendous rumours. One order followed and contradicted another in quick succession. Finally it was decided to march via Vendin-le-Vieil and Pont ˆ Vendin where there was a great block in the traffic. Bridges broken. Dead horses. Huge mine craters. On to Estevelles and Evinoy which we reached at 4 p.m.
17th. Passed through 44th. Brigade at dawn - through Bois d'Epins - Libercourt - then Wahagnies where I got bitten to death by mosquitos. 18th. On again. Camerons in front, forming advance guard to Division. On again, always just failing to see Boche by two or three hours. Then to Doeux Ville, Loffrande and Chateau de Bloc, where we spent the night. Some machine gunning. Camerons held up. 19th. Our turn for advance guard. Passed through Capelle, and several other places. Some opposition on the right, but on the whole it was child's play. Am enjoying this immensely. Am bang full up with work, but it's fine. I've a horse too, and I use it! H.Q. in the huge castle at Genech. Rode round the front line on horseback. (Note from RLM, 1972: Did I?). 21st. Off again at noon via Bercu to Mourchin, just short of the Scheldt Canal where evidently Boche was prepared to fight. Guns busier again. 22nd. Easy day. Played football against the sergeants. Won by 5 goals to 2. Pitiable scenes outside H.Q. with refugees. Appalling beyond all description. I feel bitter against the Hun, as never before. Our village is full of white-haired women, pale faced girls, and little mites of babies. Lorry after lorry has been passing through, with refugees, each piled high with a mass of suffering humanity, shawl-less women and babies. Some of the latter were even gassed. There were young women too who had been forced to work in the mines, and others who had been outraged. It was a never ending procession of the hungry, helpless, homeless and tired. I have seen some aspects of life since my last leave! I arrived back in France on March 14th, 1918, just in time to be in at the beginning of the Hun offensive on 21st. March, when he attacked us in great numerical superiority with more guns, and a heavier concentration of men, and materials, and aeroplanes than we had. I was then present when the evacuation of Monchy was ordered. Then again, I had the luck to be in it when the 3rd, 15th. and 4th. Divisions stopped his road to Arras, when we had no other reserves than the Divisional Cyclists and R.E.s - and even they were in the line - when everything looked black, and every Boche gun pointed to Paris (Note from RLM, 1972: Oh!). I was there when he made his last bid for that city, when the Division was hustled down to Champagne, and pitched into line at Compiegne, and where we had to carry out our counter-attacks on July 23rd. and succeeding days, which, carried on at every point of the line, have sent the enemy back over his much-vaunted Hindenburg line, cleared the coast of Belgium, and taken us into territory we have not seen since August, 1914. Now we have pushed forward over the Loos Battlefield of 1915, past Lens and Lille, and up to the gates of Tournai. In all my experience there has not been such an eventful period. It has been great for a mere schoolboy like myself to be present during these great shows. At night, in the midst of a tremendous argument about the League of Nations, Macleod suddenly blew back from leave. 24th. Handed over to him. Left Mouchin at 3 p.m. Stopped a corps car which took me to Corps H.Q. at Thurmerses, got a corps car to Carvin, and then obtained an R.F.C. tender to Petit Sains, near Mazingarbe, where I had dinner. 25th. Fine sleep. Walked to Noeux-les-Mines, via Bracquemont. Very few soldiers about. They have all gone forward. Car to Bethune. I'm now pretty good at stopping cars. Bethune is a pitiable spectacle - in ruins - like Ypres, a City of the Dead. One would think a destroying angel had passed over the town. A lorry to Lillers. An ambulance to Aire. R.F.C. tender to St. Omer where I had a fine lunch. Lorry to Guines, tramway to Calais which I reached about 4 p.m. Pretty good going for 24 hours! Got a room in Sauvage Hotel. Met Fyfe, Mackie, Eric Duncan, and best of all, Bobby Semple who stayed the night with me. 26th. Embarked at 7 a.m. Changed the date of my leave warrant so that I got over the day before. After all I had signed it myself! (Note from RLM, 1972: I think!). Crossed over with all my souvenirs, and reached Dover at 11 a.m. Wired L.M.M. to meet me in London, but she went to the wrong place. Bath at Euston Hotel. Gati's for dinner. Chin Chin Chow at night. Nearly lost my train. Travelled up with Bob Semple to Carlisle. Arrived home at 9.20 a.m. on 27th. and met Father. 9th. November 1918. Leave finished and it was good. 10th. Met L.M.M. in London. Stormy day at Dover. Good tea as usual. Good dinner too! Great shouting in streets of Calais at night. News of Armistice. 11th. November. Mobs rushing singing through the streets of at night. News of Armistice confirmed - Thank God! I set off again for the battalion, but stopped en route to give me a chance of finding the grave of my friend, John McIntosh, a gunner, killed at Neuve Chappelle. Found gun pits. No graves nearby.